The 2012 Cobra Jet FR500CJ returns in 2012 with changes that include a new aluminum-block 5.4-liter V8, a modified suspension, low-drag racing brakes, and new black anodized wheels. You can top the engine off with either the 2.3-liter TVS supercharger or the 4.0-liter Ford Racing Whipple supercharger. Both yield a 425hp engine. And can push the car to under 10 second quarter mile time! A quantity of 50 units were built and were available in Race Red, Grabber Blue, and Winner White paint color. The graphics on the sides are options. 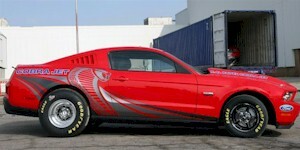 Check out this awesome 2012 Mustang Cobra Jet race car! It's from Spradley Auto Network in Pueblo, Colorado. This is a factory race car! But, the car has never been raced. It has all the go fast goodies; 5.4l DOHC with 2.3L TVS supercharger, 3-speed C4 Auto Race transmission, 9" rear axle with 4.29:1 ratio, a NHRA certified roll cage, and the NHRA Stock Eliminator legal interior. Ford calls this the quickest accelerating production vehicle ever made. The car will execute a 60-foot launch in 1.3 seconds and the quarter-mile in under 10 seconds. Wow!!! We spotted this 2012 Mustang FR500CJ coupe at the 33rd annual Mustang and All-Ford Show in Springfield, Illinois on August 24th, 2011. It's a Ford factory race car! This was our featured Attitude Of The Week for the week starting October 9, 2011. This car is one of fifty units built in 2012. They came in red, blue, and white. Like it? We have one for sale - check out our For Sale link at the top of the page. This AOTW was drawn by guest artist, Jessica Klein.